The Kyoto Ninenzaka Yasaka Chaya Starbucks is the world's first Starbucks joint with tatami seating. It's a great place to experience a traditional Japanese atmosphere along with tasty coffee. World-renowned coffee chain Starbucks Coffee has shops throughout Japan, and is a go-to spot to rest for both locals and tourists. In several regions you'll find special concept stores that are especially popular. A new Starbucks shop was opened in the famous tourist destination city of Kyoto on June 30th, 2017. This is the Kyoto Ninenzaka Yasaka Chaya store. 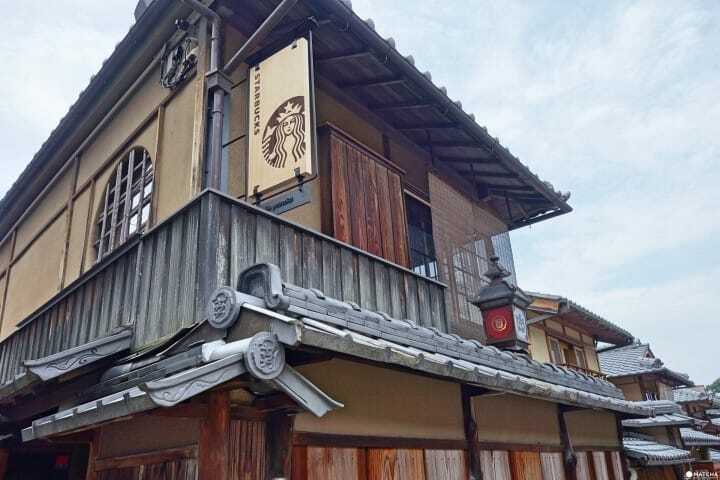 It's the first Starbucks located in a traditional Japanese house. The shop is located on Ninenzaka, which leads to the World Heritage site Kiyomizudera Temple. From planning to opening, it took 10 years to bring Starbucks Coffee Kyoto Ninenzaka Yasaka Chaya to life. Kyoto already has various concept stores where visitors can enjoy traditional Japanese atmospheres, such as the Kyoto Karasuma Rokkaku store near Rokkakudo, the temple where ikebana originated, as well as the Kyoto Sanjo Ohashi shop which has a "noryodoko" (*1) by the Kamo River. The Starbucks project team planned and wanted to create a "one-of-a-kind shop that conveys the culture and history of Kyoto even more than before." But it wasn't easy. Finding the perfect place was harder than expected, and most traditional Japanese buildings are small and not fit for such services like a coffee shop. On top of that, reforming an old building seemed a very difficult task. They say that even after the right building was decided, turning it into a shop while complying with regulations wasn't easy, and the Kyoto Ninenzaka Yasaka Chaya shop was only completed with cooperation from local governments. *1 Noryodoko: A space for eating and drinking established by a river. Guests can sit back and relax while enjoying a view of the river. The exterior of the shop is fairly simple. You might even pass right by it if you're not on the lookout. It's nestled on a street and doesn't stand out at all. Other than the noren at the entrance, there's an lantern with the coffee chain's logo, and the word "Yasaka" engraved into the kawara tiles. In the front yard of the first floor you'll find a tsukubai (*2) arranged from a rock arrangement of a tea ceremony Iemoto (*3) school, the Omotesenke. *2 Tsukubai: an item used for decorating Japanese gardens consisting in a small waterplace. *3 Iemoto: a family that has played an important role for generations in transmitting a certain Japanese art. Other than the exterior, the inside of the shop is also decorated in detail. The hanging scroll found on the wall of the tatami room is titled "Toki" (Time). The roasted dark brown coffee beans and water from the springs that has continued to flow for over 1,000 years are represented together. The artwork further in the back is called "Taki" (Waterfall). It is said to be based on pouring coffee droplets and the Otowa Waterwall of Kiyomizudera Temple. The Yasaka Chaya store is two stories, and boasts 51 seats. The first floor has chairs and the tatami seats are on the second floor. You will need to take off your shoes to sit on the tatami seats. One thing you need to be careful of is that you can't wait outside. People lining up outside the shop get in the way of passersby so the Kyoto Ninenzaka Yasaka Chaya shop prohibits it. If you want to wait for your turn, you should go inside and consult a staff member. This is the first Starbucks with tatami seats. If you love the historic city of Kyoto, as well as Starbucks' coffee, we recommend stopping by. GINZA SIX - A 6-Starred Facility That Will Widen Your Horizons!